We’d love your help. Let us know what’s wrong with this preview of This Side of Wild by Gary Paulsen. To ask other readers questions about This Side of Wild, please sign up. Memoirs are a huge part of Gary Paulsen's career. He led a life of fascinating variety, from driving sled dogs over hundreds of miles of frozen Alaskan wilderness, to cruising the Pacific Ocean alone in small boats; from serving in the U.S. military, to living in Midwestern solitude with his wife and a menagerie of animals. As he did in Woodsong, My Life in Dog Years, and Puppies, Dogs, and Blue Northers, Gary Paulsen delivers a new batch of his adventures in This Side of Wild: Mutts, Mares, and Memoirs are a huge part of Gary Paulsen's career. He led a life of fascinating variety, from driving sled dogs over hundreds of miles of frozen Alaskan wilderness, to cruising the Pacific Ocean alone in small boats; from serving in the U.S. military, to living in Midwestern solitude with his wife and a menagerie of animals. As he did in Woodsong, My Life in Dog Years, and Puppies, Dogs, and Blue Northers, Gary Paulsen delivers a new batch of his adventures in This Side of Wild: Mutts, Mares, and Laughing Dinosaurs, acclaiming the intelligence and boundless loyalty of the animals he has known. Successful at writing Western fiction, Gary Paulsen bought a pair of horses to do some exploring in Wyoming's Bighorn Mountains. He knew little about managing horses, but his border collie Josh (an unforgettable character from My Life in Dog Years) had the presence to inspect the horses Paulsen planned to buy and give him the silent okay. Paulsen learned a great deal roaming the mountains with Josh and those horses. Later, after twenty years' absence from racing sled dogs due to heart issues, Paulsen could no longer resist the call of the Iditarod, and moved to Alaska to train a new team of dogs. While the dogs were away for summer, Paulsen needed a canine to keep watch for bears and wolves, but the only one available was Corky, an eight-pound toy poodle from a shelter. Corky's medical bills cost Paulsen more than $1,000 before the poodle set foot in his house, but he was worth every cent. The tiny dog had a finely tuned sense of danger, essential for Paulsen to remain safe working outside in wild Alaska. Corky wouldn't tolerate animals encroaching on his territory, and he guarded Paulsen with crazy devotion. The poodle became the latest in a long line of extraordinary dogs Paulsen owned. A troubled young soldier in 1959, Paulsen's anxiety lessened after meeting elderly Mr. Winnike. The man had a mynah bird named Betty with absurd talent for vocal mimicry, and a dog named Gretchen who Mr. Winnike claimed was intelligent beyond human reckoning. Gretchen recognized and responded to hundreds of English words, but beyond that, she comprehended abstract themes in conversation. She and Paulsen developed a system of communication as effective as traditional language, and their talks soothed him during a rough time in his life. We move ahead to the story of Brette Howard, an old lady with a lap dog named Faulkner. She insisted Faulkner was clairvoyant, and Paulsen came to agree; everything Lady Brette predicted for Paulsen turned out to be accurate, and in incredible detail. Soon Paulsen was tending sheep with a man named Louie and his border collie Louise, who understood caring for sheep better than Paulsen or Louie. She did most of the work, but loved Paulsen until a mistake he made soured their friendship. You don't always get a second chance with animals. Paulsen rounds out this book with anecdotes about the savvy and tenacity of wild creatures. Bees and little birds in secluded rest areas along the California interstate don't appreciate people messing up their plans, and ravens are relentless if they feel you've wronged them. Paulsen learned that after accidentally crossing a raven caught in a poacher's trap. Nature is brimming with wonders, but don't take it lightly or you might not survive the great outdoors. This Side of Wild is nowhere near as emotional, wise, or cogent as Woodsong or Puppies, Dogs, and Blue Northers. It's closer to Paulsen's Caught by the Sea, though it lacks that book's captivating scenes. Still, I love Paulsen's memoir literature, and This Side of Wild includes a couple of good stories. The best, in my opinion, is Gretchen, a dog Paulsen bared his soul to by "discussing" things they liked and didn't like. Is there any better way to get to know someone? His belief that they were truly communicating was reinforced by meaningful gestures on Gretchen's part when Paulsen needed them most. In this memoir, Paulsen serves up a variety of anecdotes about the animals that have come into his life at various times. These include an account of a small rescue poodle, Corky, who is a more vicious guard dog than he expected, a dog named Gretchen who liked to sit at the kitchen table and "talk" to him, and two horses that went with him exploring. Paulsen's experiences are certainly unique and interesting, and a good choice for reluctant readers, since this is only 144 pages. One of our 7th grade language arts teachers does an author study on Paulsen, so I'll definitely have to buy a copy. Strengths: This would be easy to pair with some of Paulsen's fiction texts, or to use as a class read aloud, since the anecdotes aren't terribly long. Weaknesses: This felt sort of like Paulsen took a bunch of notes he had assembled for books that didn't quite work and through them into this collection. Not his best work. 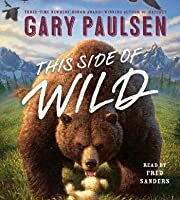 The book "This Side of Wild", is by Gary Paulsen, and talks about his experiences with animals that have made an impact on his life. Many of the animals he talks about in this book are dogs. To begin, he talks about one of his pets as a child, a large work horse, that he used to play with. He used to play Cowboys and Indians with a friend from this horse's back. That is, until the day the horse said enough was enough. Gary had made a homemade bow that he had been aiming at the barn wall. 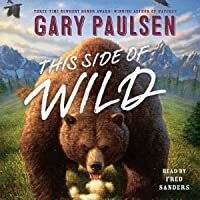 The onl The book "This Side of Wild", is by Gary Paulsen, and talks about his experiences with animals that have made an impact on his life. Many of the animals he talks about in this book are dogs. To begin, he talks about one of his pets as a child, a large work horse, that he used to play with. He used to play Cowboys and Indians with a friend from this horse's back. That is, until the day the horse said enough was enough. Gary had made a homemade bow that he had been aiming at the barn wall. The only problem is that when he let the arrow go, it bounced off the back of the horse's head. That was all it took and Gary was sailing through the air after being bucked off the horse. The horse then walked away from him and never allowed him to play near him again. This taught Gary to respect animals, and their power, as the horse could have very easily hurt him severely instead of walking away. He then goes on to talk about a mangled guard dog pet poodle named Corky that he saved from a shelter in Alaska. He explained how protective the toy size dog was of him, and how he more than once alerted him of bears and other animals he could not see. He then talks about crows and another bird and one last dog named Gretchen. He explained in a hard to understand way how he had communicated with this dog, and how it had trained him instead of him training her. I'll leave the rest of the book for others to read and find out what happens. I will say this the stories that Gary tells throughout the book are very amusing. I also liked how he uses a very different view for as to why things happen in life instead of the common view that humans rule everything. The other thing I liked about this book was that I could make many connections between his life and books he has written. The only thing that I didn't like about this book was that some of the animal training humans part with the dog Gretchen was hard to follow. This may just be because I'm not used to thinking about human animal relationships like that. I love Gary Paulsen. So I was surprised to find this new book at the library. How had I missed it's debut!?! I plunged into it. THIS SIDE OF WILD isn't a long book and I read it in a few hours. I think it's a combination of true life and exaggeration. But I could be wrong. I do know that it draws on Gary's diverse life experiences. It touches upon a time when he was in the army, as well as when he was a wee child. He recalls his experiences running the Iditarod and living in the desert. Tying all I love Gary Paulsen. So I was surprised to find this new book at the library. How had I missed it's debut!?! I plunged into it. I do know that it draws on Gary's diverse life experiences. It touches upon a time when he was in the army, as well as when he was a wee child. He recalls his experiences running the Iditarod and living in the desert. Tying all these episodes together are the animals he has loved and admired. And in fact this book is all about the magic of life and the magic dogs and horses and birds can bring to it. The stories are wonderful in the way that Paulsen's works always are. However I'm going to add some observations that are critical. First, there is a jumpy feeling to the book. In the midst of a story the author will look back in time. It adds depth of understanding where Gary is coming from, but the feel and flow is different from previous books. *The jumps in time actually have a virtuous side in that there are natural stops that can be used by anyone reading the tales aloud. The other thing I'll note, but which really isn't criticism, is that some sensitive younger children might find some of the discussions of death distressing. There is nothing graphic of course, but the book talks about the hundreds of thousands that died at Hiroshima and Nagasaki, as well as those who were killed by wild life and accidents. These things are not dwelled upon but I know that some kids don't need them to be emphasized to be distressed by them. WHAT I REALLY THINK::: THIS SIDE OF WILD is a wonderful collection of stories about the wonder of dogs, horses and birds. Gary talks about how its frequently animals that train us, not the other way around. How dogs and horses can show kindness and intellect if you only know to patiently look for it. And how an 8 pound poodle with only 3 teeth can growl down a grizzly. I often struggle when trying to be objective and review books for younger readers. Gary Paulsen makes it easy though with This Side of Wild because it doesn't read like it's intended for a certain age group: it reads like a guy reminiscing and telling stories about animals (and some humans, too). If I had picked this up without any knowledge of the audience I would only have thought it short at about 120 pages. Very conversationally, Paulsen tells stories, often interrupting himself to tell a li I often struggle when trying to be objective and review books for younger readers. Gary Paulsen makes it easy though with This Side of Wild because it doesn't read like it's intended for a certain age group: it reads like a guy reminiscing and telling stories about animals (and some humans, too). If I had picked this up without any knowledge of the audience I would only have thought it short at about 120 pages. Very conversationally, Paulsen tells stories, often interrupting himself to tell a little aside that will illuminate his current story even further. At first I found his self interruptions mildly distracting but very quickly it makes sense, just a guy sharing perspective. middlegrade nonfiction. Gary Paulsen true adventure stories with more animals? I thought he couldn't miss with that one, but I found the entries inside a bit fragmented, like partial journal entries from a mind that wanders a lot. Which still might be really good, but I was hoping for something that younger kids might pick up and get into right away, and after 18 pages I hadn't found that. This book is the type of book thats meant to turn into a classic. In select snippets from his lifetime of interacting with animals, Gary Paulsen describes preparing to dogsled the Iditarod through the Alaskan wilderness and facing off with the murder of smart, mischievous ravens. He writes reverently about a dog named Gretchen that figured out her special means of communication and then trained her human companions how to speak it. And he affectionately honors the sickly, nine-pound toy poodle that once saved his life from an overly curious grizzly bear lurkin In select snippets from his lifetime of interacting with animals, Gary Paulsen describes preparing to dogsled the Iditarod through the Alaskan wilderness and facing off with the murder of smart, mischievous ravens. He writes reverently about a dog named Gretchen that figured out her special means of communication and then trained her human companions how to speak it. And he affectionately honors the sickly, nine-pound toy poodle that once saved his life from an overly curious grizzly bear lurking near his backyard. Gary Paulsen is an amazing writer, and his prose is driven by his incredible experiences in life. I had no idea he competed in two Iditarods, lived in the Minnesota wilderness and climbed Bighorn Mountains. These adventures have given him endless stories about nature, and I was thrilled to read this short book on his encounters with wild animals. This really is a compilation of short stories, but there is a fine thread of continuity in this compendium of observations about living things in nature Gary Paulsen is an amazing writer, and his prose is driven by his incredible experiences in life. I had no idea he competed in two Iditarods, lived in the Minnesota wilderness and climbed Bighorn Mountains. These adventures have given him endless stories about nature, and I was thrilled to read this short book on his encounters with wild animals. This really is a compilation of short stories, but there is a fine thread of continuity in this compendium of observations about living things in nature. And, that is, man needs to understand and admire the ability to survive in the wild. Whether you are man, who thinks he is superior to animals, or wild animal that proves you are wrong - survival is basic to all of us. Gary Paulsen is hysterical in this book about the shrewdness, wisdom and kindness often overlooked in animals. His many fantastic, true stories are told in a light-hearted self-depricating manner that definitely keeps the reader engaged. It's also a very quick read, which is nice. I didn't give this a full 5 stars because there is a little bit of foul language (despite its being published by Scholastic) and I feel as though Paulsen holds animals' intellect and authority a little too high at time Gary Paulsen is hysterical in this book about the shrewdness, wisdom and kindness often overlooked in animals. His many fantastic, true stories are told in a light-hearted self-depricating manner that definitely keeps the reader engaged. It's also a very quick read, which is nice. I didn't give this a full 5 stars because there is a little bit of foul language (despite its being published by Scholastic) and I feel as though Paulsen holds animals' intellect and authority a little too high at times -- seemingly suggesting that humans are not (or should not be) the dominate, crown jewels of Creation that God made us to be. Some great stories from Paulsen's own experiences. It makes a person think about the different powers of animals we have in our life. We may think we are the ones in charge here, but who is really training whom. The stories in the book show some of the power and wisdom which comes from the animals in our lives. I also really like the three questions at then end. It is enough to get a person thinking. I reviewed this book for my class, which I quickly discovered was not written for 4th graders, as the vocabulary was a little advanced. Gary Paulsen's writing, as usual, was good, but (to me) something felt disjointed in this book. This Side of Wild is a nonlinear autobiography of the author's life, focusing on the animals in his life that had the most influence on his life and thinking. Not bad overall, but perhaps just not my cup of tea. Gary Paulsen has miles of outdoor experience and friendships with animals. In this memoir, he tells some of the uncanny events that occurred with dogs and horses of his life. Through his observations of nature, he comes to believe that animals are more intelligent than we give them credit for, and that they often are the trainers and we the trained. He has some very interesting perspectives and I'm excited to recommend this book to kids who love his fiction. This book was okay. I kind of liked it, but had issues with it at the same time. It had very boring formatting. It was so boring that it made me want to through it out a window. But only at some points, like when he was setting the tone of the story. Other times it actually pretty interesting. Like when he was actually talking about the animals. So basically I tolerated the boring parts to get to the good parts. A memoir of sorts, in which Paulsen recounts true stories of how he learned that man is, indeed, not the top dog on the planet. He personally witnessed dogs training humans to do certain things, as well as birds, bees, and other creatures doing the same with humans and other animals. A short, quick read that will entertain you, as well as inform you about the nature of things. This is a short account of different animals that Gary has encountered throughout his life. Some are dogs, but not all the stories are about his furry friends. He has learned valuable lessons from many other species that we can all find valuable as well. While not the best I have ever read from Paulsen, I thoroughly enjoyed his stories. Good for all ages! This is an excellent story about the animals around us. Paulsen has become schooled in what makes each animal tick and the hidden treasures that each beast has. This book holds a wealth of stories about the genius of birds and the dexterity of several mammals we all know. It even mentions the genius of dogs. Although I loved hatchet, this book left me flat. I'm not sure who the audience is supposed to be. It has a cute cover and is being promoted in the Scholastic sales magazine, but the stories move too slow for the children I teach. I won't be purchasing this for the school library or putting it on the shelves because I don't see my students wanting to read it. His life experiences with animals and what he learned from them are fascinating! I'm not sure I see things philosophically the way he did, but I did enjoy hearing his stories. He has done some amazing things during his lifetime. I appreciated his humor during his story-telling. This was a good audiobook for our short road trip. This book has some really cool stories, but a couple of them focus on the author being worried about how animals might hurt him, and it tells stories about people he heard about who got hurt by animals- this book isn't really appropriate for young or highly sensitive readers, but the stories in it are funny and engaging. The many stories in this book are brilliant and the fact that they are real life makes them that much more compelling. I was hooked from the first page and everyone there after. A gold mind for reluctant readers since the stories are packed with adventure and short enough to keep wondering minds focused.